where is the water coming from, i.e. the cause of the problem, and where is it going to go to – the outfall? An efficient drainage scheme will eliminate water logging, reduce compaction and allow easier maintenance and more flexible management of valuable resources. 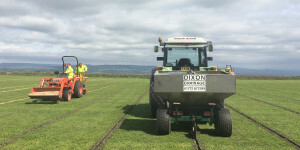 Improved drainage will result in improved soil structure and a better quality grass sward. As members of The Land Drainage Contractors Association (LDCA) we recognise the need to promote, achieve and maintain high standards in sports turf drainage works. 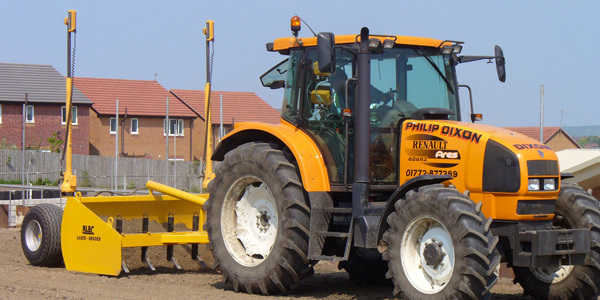 Professional design and expert installation are regarded as equally important factors in any successful drainage scheme. 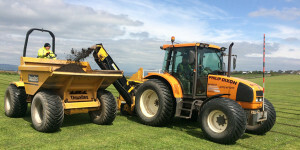 The design of individual drainage schemes depends on the underlying soils, the site location, the sporting activity, the amount of usage, and finance available. The professional installation of sportsturf drainage systems involves the use of specialist plant and machinery, using fully equipped and experienced operators. 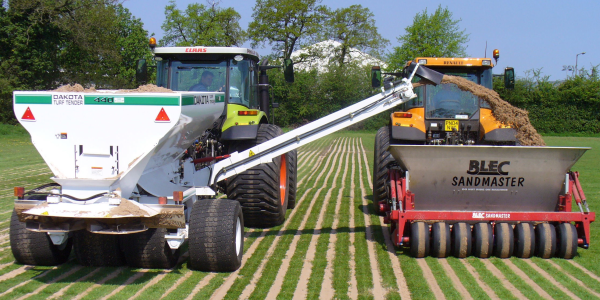 All of our wheeled equipment uses low ground pressure tyres to reduce soil compaction and to prevent rutting. 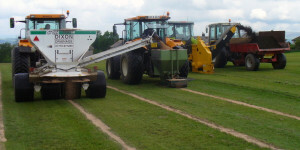 Best practice is to install sportsturf drainage when soil conditions are suitable. 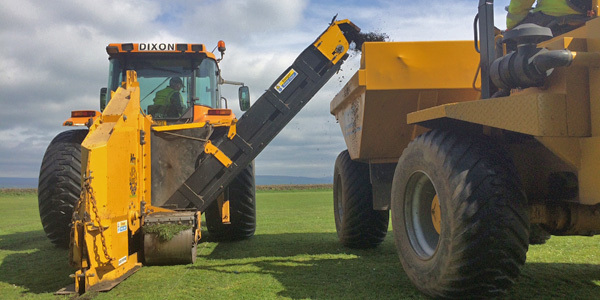 When draining through existing turf, every care should be taken to prevent contamination of the surface with soil or back fill materials. Excavation of the drainage trench is carried out using a continuous chain trencher fitted with laser controlled grading equipment and a spoil removal conveyor disposing directly into dumpers to prevent contaminating the surface with subsoil. 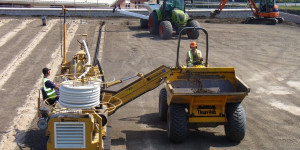 Drainage pipe is laid on a pre- formed trench bed, and back filled as specified using machinery specifically designed to place back fill materials into the trench without spillage of the back fill onto the surface. 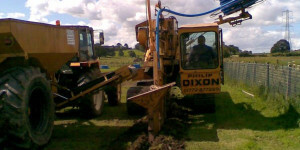 Laser controlled open trench drainage. 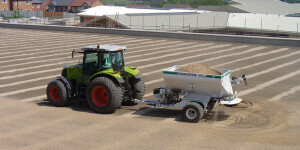 Conveyor elevates arisings directly from trench to dumper/trailer avoiding contamination of turf. Placing of clean aggregates, sands, etc. in trench directly after excavating, without spillage. 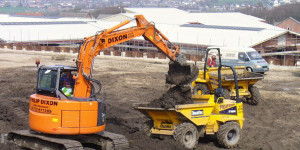 Essential to avoid trench collapse or contamination. 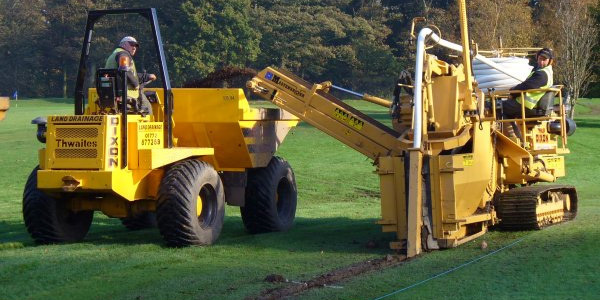 A secondary drainage system can be installed where primary systems are insufficient to disperse all surface water. Secondary drainage systems intercept surface water and convey it rapidly to the lateral drains of the primary system. 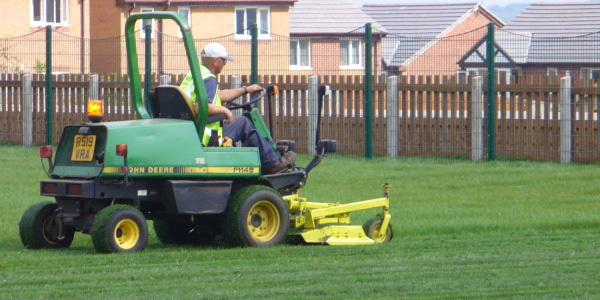 This ensures that playing surfaces are usable as soon as possible following heavy rainfall. 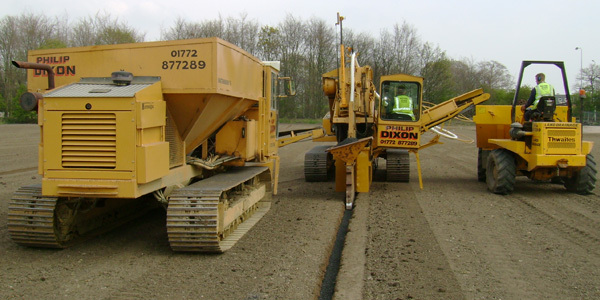 Typical secondary drainage operations include sand slitting and gravel/sand banding among others. Slit drainage (sometimes known as sand slitting). Normal spacing 1 metre. 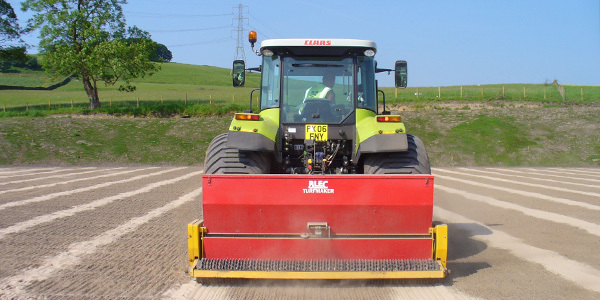 Slits are cut approximately 50mm wide up to 350mm deep. Backfilled with clean aggregate topped with sand/root-zone. Spoil elevated directly into trailer. Sand/Gravel banding. Sometimes used as an alternative to slitting. One pass operation which cuts a slit, fills with sand, gravel or clean hard aggregate. A popular method used to rejuvenate tees and greens. The Blec Ground Breaker and Sand Master relieve compaction and installs a secondary drainage system of sand bands to link directly to the underground drainage system. The bands are at 260mm centres and up to 200mm deep. Good method for rejuvenating slit drains. 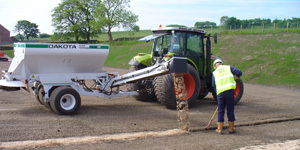 The Ground Breaker can be used without the Sand Master to relieve compaction. 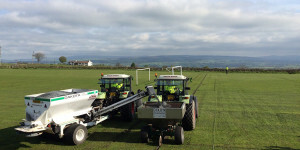 Construction of a new pitch. Stone rake rows up stones ready for the picker. 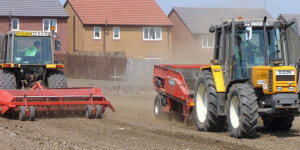 Stone picker elevates the material and riddles the good soil from the stones and sods. Good soil falls back to the ground. Debris is placed in collector box then tipped into a trailer. 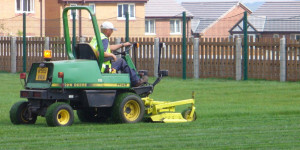 Laser grader. Grading pitch to levels ready for drainage. Laser controlled open trench drainage. 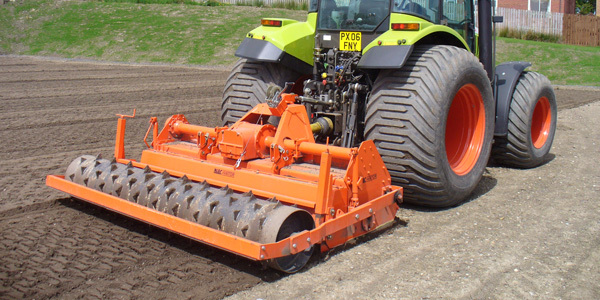 The Blecavator creates a tilth ready for seeding and buries stones in one operation. Sand dressing prior to seeding.